The plant is connected about 5 cm above the plant soil. The winding must be 1 mm open on its end, not shorted. Put the wire into the cable female connector. Connect the plants cable to the input of the low noise Amplifier. Connect the output of the amplifier to the TV antenna input. Test the antenna if its works. Measure the ground potential free DC-currents of microwave tubes, such as TWT’s or Clystrons using high voltage supplies. Watch the high current of a car battery without any loss . We use the well known DC-current measurement method, where a DC current changes the inductance of a coil wound on a core having a hysteresis. The core must be dimensioned in such a way , to change the hysteresis by means of the DC current to be measured flowing only trough one up to three windings on the core. If the temperature never changes and each core would have exactly the same hysteresis , the development would be very simple. But its not the case. We solve this two problems using a feedback circuit witch cancels all unlinearity and outside influences. The circuit used is shown in Fig.1 . We see two controlled inductances. K1 and K2. 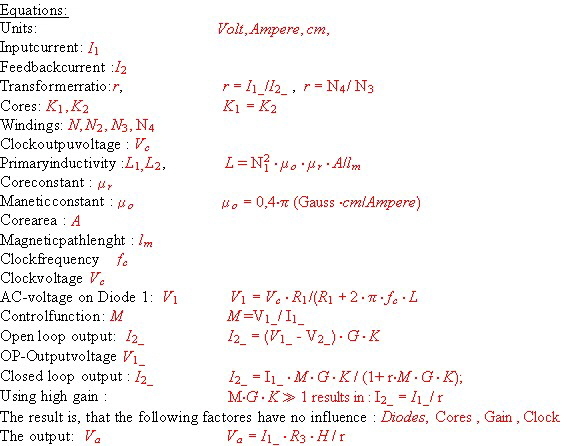 Each inductance is connected to a AC voltage to be divided by the inductances. K1 is controlled from the measurement current I1 whereas K2 is controlled by an feedback current having a proportional value of I1.The difference DV of the DC voltage from both dividers is amplified and leaded back to K2. Its obvious, DV is kept constant in this circuit even if the core constants or the temperature changes. Fig.2 shows, the loop equations. 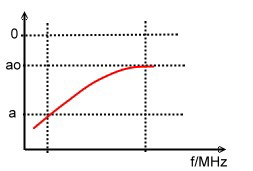 Fig.1 Potential free DC-current measurement. Fig.2 Equations to DC-measurement; DDR Patentschrift 157981 Institiut für elektrische Hochleistungstechnik. #1: At lower band end the transformer works as usual device where the primary inductance certain's the band end frequency fu. Fig.2 shows, the cut off frequency circuit and formula. We use varnish wire AWG 38, 6 times per cm twisted. ZL~70 Ohm. Z ~ 120 Ohm. Practical devices of this type my span 3 decades. Up to now , we could realize the ratios of 1 and 4 .To match practical circuits , different ratios are necessary. This can be reached in mixing normal design with broadband design. Fig.4 shows this solution having a Z-ratio of 2. As the single winding N3 has low coupling, we must compensate the stray inducdance using a series resonator Cs and Ls. In high bit rate digital communication systems, components having very broad band transmission are necessary. If we imagine that one bite must not be flattened and make an fourier analysis of one bit, the necessary upper frequency must be about10 times the bit rate . As bit rates my vary from khz to Mhz range a band with from khz to Mhz are necessary in a universal digital modem.The necessary input transformer must therefore cover 4 decades. This values can be reached , using 4 twisted wires, one of them is N3 of Fig.5. but is shorted into the twisting.The series resonator is build inside the transformers windings as Fig.5 shows. 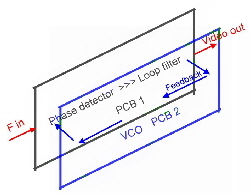 Due off unavoidable parasistics, RF circuits on PCBs are deteriorated by a roll off up to 1dB. A simple circuit can linearize this roll off. 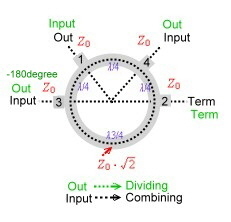 The DD-circuit was developed at the latter days of analog feedback design to differentiate (DD) the signal getting better time behavior, but we will use it as linearizing circuit. Fig.1. Shows a T-circuit having a certain impedance, which is bridged by two capacitors. PLL FM Demodulators are widely used in communications receivers, because of its low noise threshold. Below this threshold the demodulator noise will increase drastically. 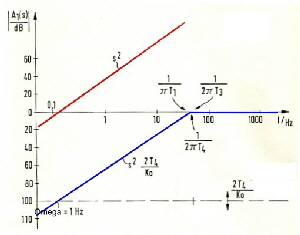 Fig.1 shows the typical Input Signal to Noise Ratio versus Output Signal to Noise Ratio diagram of an PLL- FM- Demodulator. A very good value of the threshold TS is 6dB.The threshold formula shows, that lower values are difficult to develop. 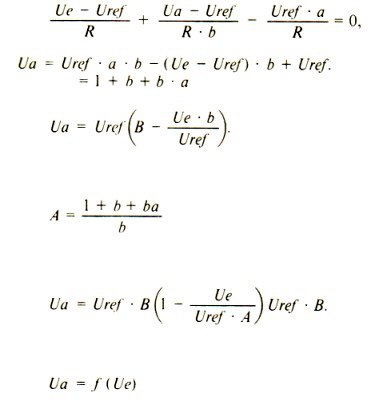 From this Formula, it is obvious, the threshold only can be optimized , by increasing PLL bandwidth and speed. Only using a high order loop will increase PLL speed. An high order PLL, to be used as an FM-Demodulator, must be made faster than the simple ones. The earning of the bigger bandwidth leads to higher signal sensitivity . In the Literature, one can find first order and second order loop PLL’s. But this circuits are limited especially in the bandwidth of the PLL at the upper bandend. In this demodulator application, the parasitic’s of a PCB will decrease the bandwidth. A way out of this problem is to use high-order filters and increase the total order of the PLL in producing extra phase for loop stability. 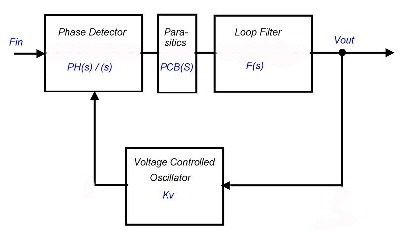 Fig.1 shows the discriminator circuit. Fin is the FM modulated carrier. The demodulated video signal then appears as Vout. Certainly this compensation works only to a certain value after this , it breaks down. Fig.4 shows the AGC-circuit , having a RF-detector in the closed loop. Under normal condition , the power Amp. has a working point in the linear part of then gain-plot of Fig.3 until the loop regulates the working point back to its normal values. In case of an input power step this working point moves along the curve. Having an uncompensated AGC the working point may move to a Flip-off point , where the loop are not abel to regulate . But using the new circuit, the working point moves along the red curve, where the flip-off point is a few dB higher than in an usual AGC-Amp. circuit. In the telecommunication code multiplex technology, the modulated signal is spread with a codeword. This technique is called spread spectrum. (SPRSP). In a SPRSP receiver the code word must be found and looked to be received. Fig. 1 shows a standard delay look loop to be locked to the code word which has a certain length, for instance 256 bit. We see here a code generator to generate a certain codeword.The code generator is shifted in its phase from a voltage controlled oscillator to be locked in with the incoming, code word. If they coincide, the loop is looked.The shifting of the code word versus the incoming code word has a control AKF-funktion of Fig.2 The linear look-in control range of the feedback is plus minus 1 bite.Outside this control function the loop may flip out and the signal path is interrupted. In Fig. 3 is a new AKF-Loop shown where the lock-in range is twice. The total lock in process is now easier and faster.This broader AKF is reached by summarizing the output voltages of the detector instead of subtracting them and switch the code generator periodically plus minus one bit. A simple active splitter can divide Power very precisely. Look at Fig. 1 where a doubel-T resistor network is used. An RF. 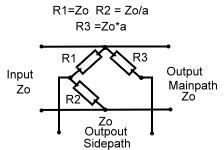 -OP-AMP amplifies the divided power.This splitter may split the signal to a intermodulation feedback system. Fig.1 Active 50 Ohm splitter. Wave line and twisted wire wave line combiners and dividers. 1.0 The Wheatstone Bridge as a coupler. The easiest way to couple a signal in the range from DC to 500 MHz into an other path, is the use of a Wheatstone bridge. The advantage of this circuit is: He is only resistive, has no transformer no complex wiring and is ideal for digital broadband application. But the outputs have no reference to ground. Fig.1 Therefore this bridge is seldom used. At lower frequencies , the 2 outputs can drive a RF-Operational Amplifier . Fig1 shows a circuit and its resistance values depending on the coupling factor a. Twisted wire wave line combiners and dividers are realized using a combination of broadband wave line transformers. Due of the used technique they are restricted to relatively low frequencies, but they have the advantage to be very broad banded and very small in size. It is therefore sometimes desirable to realize such a combiner for high frequencies up to 1 GHz. This becomes clear, if one compares the size of an 3 dB strip line coupler having a dimension at 1 GHz of 7*7 cm, with the 0.5 cm square of a twisted wire combiner. A standard twisted wire wave line combiner is shown at Fig1. Two equal wave line transformers are connected in series. The input transformer matches the power dividing output transformer. This arrangement may be used as combiner or divider. The capacitor compensates the stray inductance’s at broadband applications. 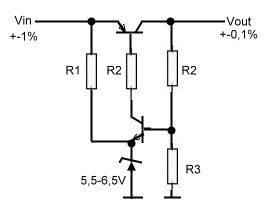 This circuit obviously is a three port. Using a simple 1:1 normal transformer realizes a four port device, Fig.2. Here, the transformer will limit the bandwith. 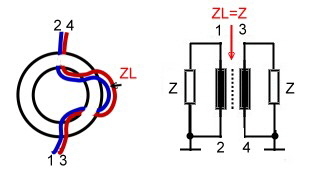 A better RF- solution is it, to connect wave lines or twisted wire wave lines in a series- parallel circuitry, Fig.3 .The wave lines at Fig.3 may be replaced by twisted wire transformers, but if the Impedance of the twisted wire is not equal to Zo, phase deviations up to 25 degree will occur. There are many possibilities to build wave line combiners and dividers in a similar manner. Signal phase shift : Phase = 0 or 180 degree. Working range range: f =1MHz to 1500 MHz. Bandwidth : B = 30%. Isolation : up to 40 dB. Insertion loss S21 about 0.5dB. Signal phase shift : Phase = 90 degree . Working range: 100 MHz to 2GHz. Bandwidth : B = 20% . Insertion loss S21 >= 3dB . 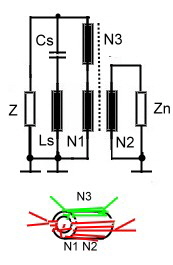 Zo = SQR(Zin Zout /2): Fig.2 shows a brunch coupler version having Lamba/8 matching stubs on the inputs . A similar microwave coupler is the ring (or magic T coupler, this is a waveguide structure) and is shown at Fig.5. This hybrid may be used as combiner or divider if the inputs and outputs are exchanged. (green = divider, black is combiner.) The phase difference of the output is -180degree. The hybrid transmission is a function of amplitude ratio and phase of the incoming signal.Therefore, to combine signals with an hybrid, they must be matched within a certain percentage in amplitude and phase. Signal Phase Shift : Phase = 90 degree ( depends on the amplitude and phase balance of the input signal). Working range range: 1 GHz to 30 GHz. Bandwidth : B = 10 % ( may be higher using special matched arrangement). Isolation = 20 dB . Wilkinson couplers or hybrids, are n- port couplers what means, signals on n-ports my either be added or divided. Indeed this coupler is not a hybrid ; therefore all outputs have the same phase of 90 degree related to the input. The basic idea, is a star network of transforming circuits balanced with lumped resistors Fig.1. The transforming networks can be either consisting of L-C-Circiuts or many wave line transformers. Fig. 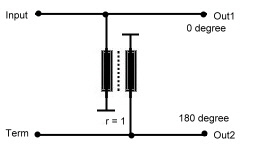 2 shows a 50 Ohm two port divider and Fig.3 an practical strip line three port arrangement. For higher frequencies the balancing resistors may be a problem an must be induction free and hat sink. Bandwidth : B = 15% . At the old RF Circuits, we matched different components, circuits and amplifiers by designing complicated lumped LC-circuits by means of the smith chart, to not loss any gain of the circuit. As gain is not the problem any more, due of integrated RF Amplifiers, matching philosophy can be changed to resistive compulsory matching. That means, amplifiers and circuits are connected using a regular resistive network having some gain loss. This loss then is compensated by using one or two more amplifiers. The advantage of this method is the total saving of matching-adjustment manpower. 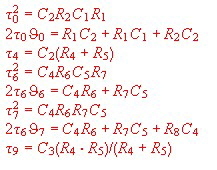 But sometimes intermodulation products my be a problem and must be calculated.. 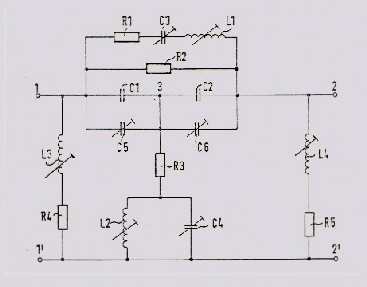 This old circuit of the seventies, is shown here as an example for understanding multi-feedback-loops. But the shown Problems of RF. power measurement and intermodulation products are still present today. 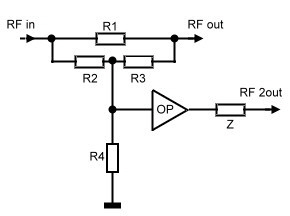 Simple circuit measures multi carrier power in a RF Power regulator. The output power of a multi carrier RF System, only can be kept constant, if the summ-power of all carriers are regulated by means of a RF-Power regulator.To regulate this multi carrier power, the RF summing power must be measured, using a prober sensor or circuit. The only true measurement method of RF power measurement, is the use of an thermal device, for instance a complicated arrangement of an absorber and a temperatur-sensitive resistor (NTC). As this is a complex and expensive component, and not a high reliability proven component like an integrated circuit, one must find a way to measure the multi carrier power by means of an other methode.The method, I propose here, is the use of an effective voltage measurement device in series with a DC-multilplicator. As a voltage measurement circuit the voltage doubler, a circuit of the latter past war electronic days, can be used. The Voltage doupler measures the effective voltage of different waveform’s if properly adjusted. 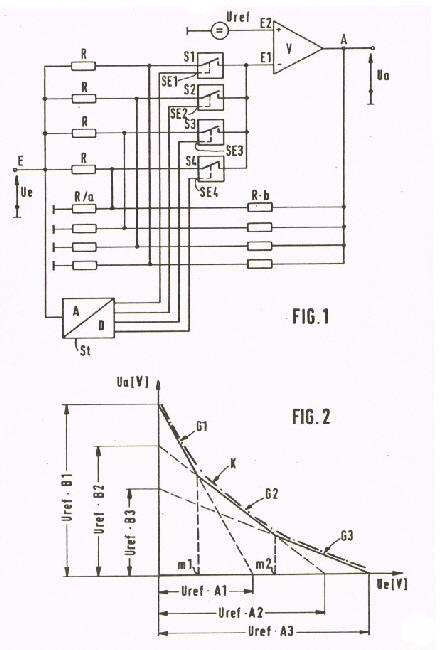 (See Electronics Feb.17, 1961), Using Schottky Diodes as rectifiers, the necessary power level must be about 0 dBm. As a DC- multiplier, an standard Transconductance OP may be used. Fig. 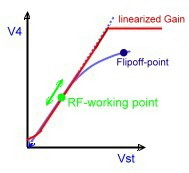 1 shows a proven measurement circuit in the feedback-path of a 70 MHz RF-power- regulator. As the voltage doubler works best on a high Ohm source, a broadband transformer is connected to the 50 Ohm RF output. The components C1 and R1 , C2, R2, must be adjusted to get the effective voltage values of carriers and noise.The gain control voltage V_ becomes : which controls a standard Gain-Control-Integrated circuit. So far, our circuit regulates the multi carrier power, but as it is in electronics, a new problem comes up :. Intermodulation. At an output-level of 0 dB and 20 carries, the two tone intermodulation-product-distance of a small integrated RF Amplifier is only a few dB. Therefore, the only solution seems to be the use of an oversized huge power amplifier. An other solution is a multi feedback regulator which keeps the output power of the carriers constant and suppresses unwanted second and third order intermodulation products. I(1,2) =2f1+-f2 and I(3,4)=2f2+-f1. This products, must be suppressed otherwise the measured RF power is not true. To suppress this products, several LC networks and loops are used. 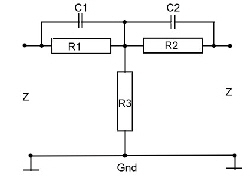 ( L1;C1/L2;C2) Fig 2 shows the total circuit of the RF output..
We find here the above mentioned Power detector (D1, D2); which is connected by means of an filter network and a transformer to a classical small power transistor RF amplifier.The output-filter network, suppresses the main part of the intermodulation products.This is the main power loop as shown at Fig.1. This loop has to have at least a gain of 20 dB at the upper end of the band (75 MHz). How this loop works shows Fig.3 where we see a gain of 30 dB at 70 MHz. Minimum Phase is 40 degree which gives a stable device. Now we look again to Fig.2 where we have two more loops 2 and 3 which suppresses unwanted intermodulation products into the output amplifier. This loops control transistor T1 as a basis circuit via a -180 degree signal on its emitter. 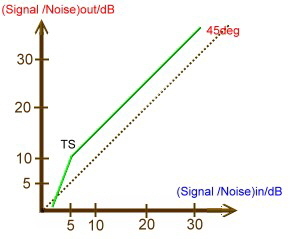 Although we use a small transistor amplifier, the two tone intermodulation products are 50 dB less the carriers.Fig.4. In case of 20 carriers, this value is > 20 dB. 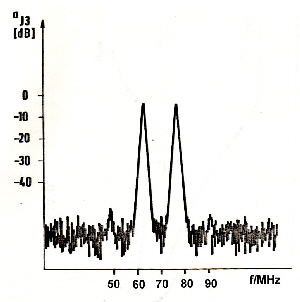 Fig.4 Two tone Intermodulation products of the multiloop BFY 90 Amplifier. 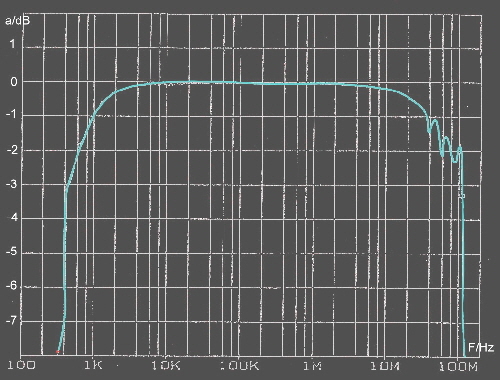 digitally divided with the counter N and compared in a mixer with a very precise very low frequency standart.The difference-DC and low frequency output of the mixer then is filtered in Fil. (s) and feed as control voltage to the VCO. = Error angel at the output of the phase comparsion circuit. The following circuit design has he goal, to realize a filter, which solves this two main equations to get a stable PLL and a very low noise at the output. Now, how does this goal com out, if we use a standard third order PLL filter ? 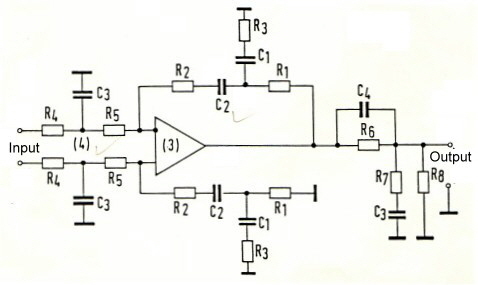 The remembered circuit of this filter is shown at Fig.2. 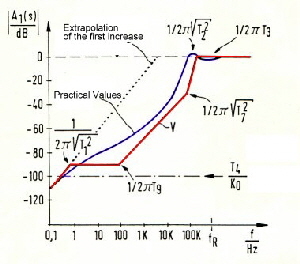 The red line is the gain differentiation (s) at a gain of Ko=1. At the left side of this line , oscillator noise is rejected. Using higher gain we get the blue line for A1(s) and a much better rejection of noise. 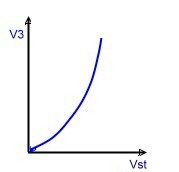 Yet the gain can not increased to very high values of Ko, due of the stability requirement of equation [. Once more, the filter OP-Amp schould not produce any negative phase angel, this means, one must use standard OP-AMP’s having a 10 MHz bandwith. After trying and working for a while, we find the filter circuit of Fig.6 . 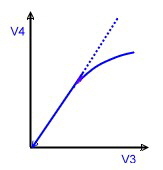 The rejection transfer is the blue line at Fig.5. Yet the computer can check stability too, and we find the loop very stable as Fig.7 shows. Fig.7 Stability of the PLL, using the new filter. 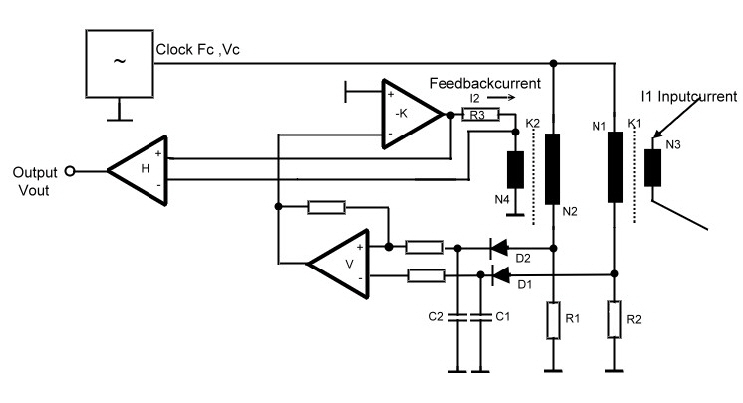 A simple crystal IC-Clock using digital components, must be analysed properly, otherwise this clock can make lots of trouble in producing noise and jitter and discrete frequencies. If we use two simple NAND Gates in series, as loop amplifiers, we get very high loop gain, but high delay time too. The phase of this dead time jumps continuously between 180 and -180 degree up to highest frequencies. 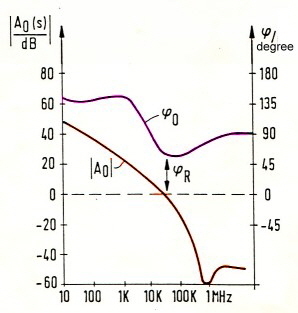 At this frequencies, the gain must be -10 to -20 dB and the phase must have a distance of minimum +30 degree from zero. Otherwise the Clock will produce a lot of noise. Corner frequency of gates: f = 50MHz. Sum of dead time: Tt = 1nS. To analyze the oscillator, we draw the standard transfers #1 to #8 into the bode plot of Fig.2 and find the zero Phase at maximum Gain of about 20 MHz at Fo. This is the Frequency the Oscillator will run. We see, that this frequency is dependent of many unstable Parameters of the NAND gates, which are not specified as an analog device. For this reason, a crystal will be connected in series to the high pass. The second problem we can see now, is the Gate Dead (delay) Time (3,4). The Phase of the dead time, jumps at twice its frequencies 1/Td to A Phase of -180 degree. Due of this jumps, the Oscillator may run at many higher frequencies too and produce a lot of noise and jitter. This would increase the bit failure rates in digital communication systems. Therefore, a Phase compensation circuit is build in, to prevent frequency oscillation due of delay time. 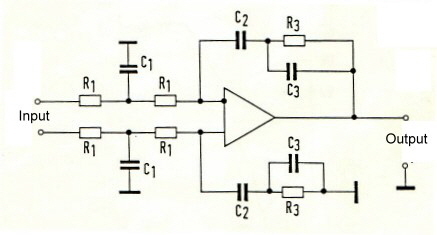 Fig.3 shoes the designed Oscillator to be used as an VCO in a communication PLL Clock.The Circuit around C1 and C2 is a standard phase correction Network and reduces high frequency noise and jitter.The values of C1 and C2 are only 1 to 5 pF. 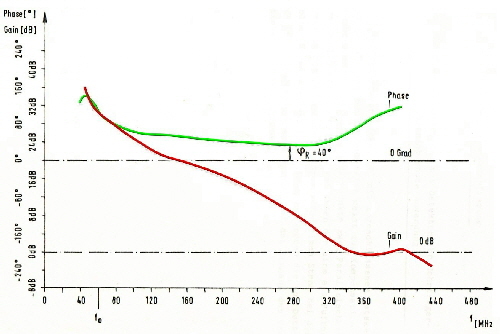 The frequency of the crystal is slightly changed, using the series shunt Cs by means of a FET transistor. Its resistance value is changed from the DC feedback voltage. The Crystal itself works in the High Q series mode , at its resonance. But at higher frequencies, the crystal works in the parallel mode so that the feedback situation is similar to Fig3. Fig.3 Crystal oscillator with dead-time compensation, using digital gates. In complex communication units the interconnections of RF signals, are realized by means of small very thin coaxial cables, having a length of only a few centimeters. But this small pieces of cable my be the source of an unwanted roll off. Therefore, watch the quality of this “unimportant “ cables, before installing it. Fig.1 Typical coaxial cable roll off . This two constants define the bandwidth of the cable. Fig.1 shows a typical roll off at a certain length of a miniature coaxial cable. The corner frequencies of the roll off depends on the two constants and the length. A short transmission measurement of the used inter wiring cable including tiny coaxial connectors, clears the problem . With the classical non-linear circuits several biased diodes are used in the feedback of an OP. 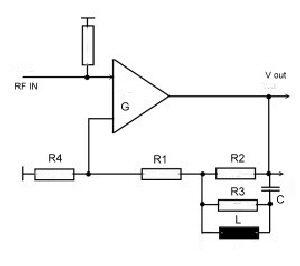 As this circuits are difficult to adjust, or not adaptable, for RF- filter tuning, another circuit was invented in 1984. As Fig.1 shows, the feedback paths are switched using FET- switches for different Gains.This are are simple resistor feedback paths. The switches are switched, using an analog digital converter. Using adapted feedback resistors, we can realise any nonlinearity to the application.The formulas, are very simple as Fig 3 shoes. To compensate for ripple amplitude due to the mismatch or losses in RF circuits, various amplitude equalizer circuits are known.Unfortunately, most of them have a high input and output reflection and and relatively high losses. The new Amlitude equalizer is good matched and has a low beginning loss.